I think we can all agree upon that Tiger Woods is still at the beginning of his golf architecture career and business. So far he was involved in 10 golf course design projects. His first golf course design project was the Bluejack National (a private golf club) in the historic Montgomery County, near Houston. Tiger Woods’ latest golf course design project (in cooperation with Gil Hanse) is the development of the Mākaha North Course of the Mākaha Valley Resort. TGR Design (Tiger Woods’ company) will lead the development of the Mākaha North Course, while Gil Hanse, creator of the Olympic Course in Rio de Janeiro, will develop the Mākaha South Course. The North Course lies in the shadows of the Waianae Mountain Range, where players will encounter stunning scenes of Mt. 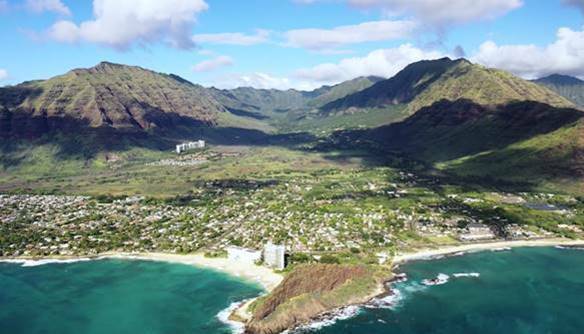 Ka’ala (an ancient volcano and the highest peak on Oahu) and expansive ocean views that contrast strikingly with the imposing emerald mountains. The Oahu island is considered as surfers’ paradise as well. This project was commissioned by Pacific Links International. The Mākaha Valley Resort is a 644-acre mixed-use property developed in conjunction with community leaders and native cultural practitioners on Hawaii’s third-largest island. According to the Hawaii Tourism Authority, the Oahu island attracted 49.6% of tourists of Hawaii tourists in the period of 2017 and 2018. December – 532 501 tourists. Over the past two years, Pacific Links International has partnered with the developer, Stanford Carr, to work with community leaders, landowners, native Hawaiian cultural practitioners, and regulatory agencies of the State and City on the long-term vision for Mākaha Valley. This encompasses a holistic traditional Hawaiian Ahupua’a concept, which considers the entire valley from the mountain (Mount Ka’ala) to the ocean (Mākaha Beach). It is not clear enough for me when they say the project will include natural resource management they mean sustainability or not. Sustainability should be their top-top priority alongside with providing exceptional customer experience. At this moment I have not found and golf club from Hawaii with certificate either from GEO or Audubon International.